Search for Workspaces is a powerful tool that you can use to quickly retrieve and display workspaces you are a member of based on Workspace Properties. If your company makes good use of Workspace Properties, and you are a member of more than 50 workspaces, we recommend using this tool for creating filtered views of workspaces, and easy navigation to your workspaces. Search results can be further filtered and sorted. 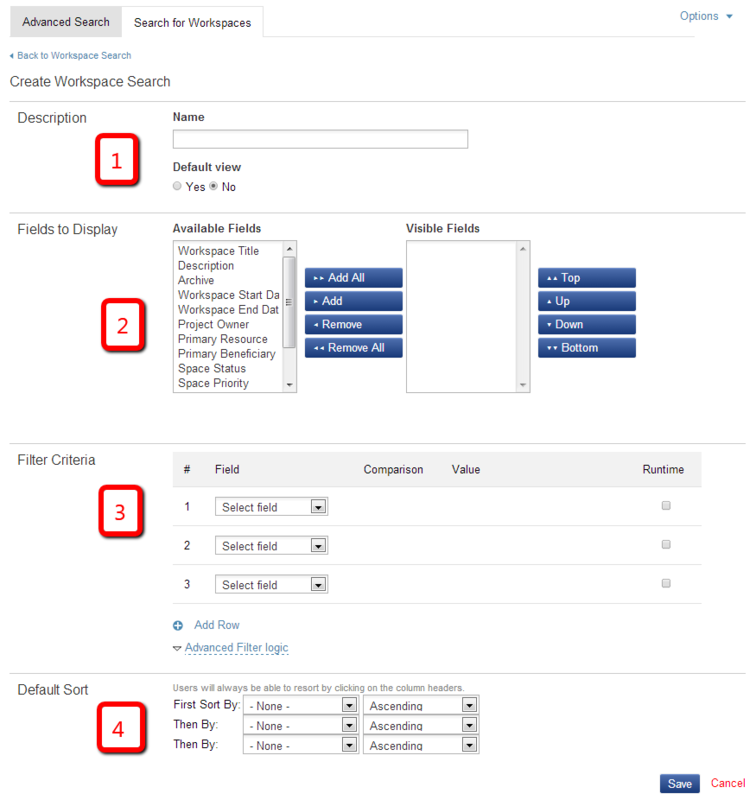 Your saved searches can be as simple as searching for workspaces with certain titles or you can search for more advanced details like specific custom workspace property fields. To navigate to Workspace Search, click the Advanced Search. While conducting a simple search, Advanced Search becomes an option in the drop down menu. Go to the Search for Workspaces sub-tab, and click on the Saved Workspaces drop-down menu to choose a saved search. Next click Create New Workspace Saved Search. The following outlines the Create Workspace Search process. Choose a name for your saved search. You can also choose to make this search the Default View. Choose which fields you want to include in your search view. All default workspace property fields and all custom workspace property fields are available to choose from. Use this area to narrow down your search results. Checking the box under the "Runtime" column will allow the user to edit the respective search filter criteria value before running the search. Leaving this box unchecked will 'fix' that criteria and not allow the user to change it at runtime. Use this area to sort your search results by specific fields. Once a list of your workspaces are displayed you can run an additional, regular search for specific items (like files and other documents) within the workspace search results.